The Holiday Inn Express Hotel Tuscola is a three story hotel featuring 82 guest rooms and one Meeting Room accommodating up to 25 ppl. Holiday Inn Express Hotel Tuscola offers King Bed Rooms, Two Queen Bed Rooms and Executive Rooms with King Bed, Sofa Sleeper, Microwave and Refrigerator Free Wireless High Speed Internet, In-room Coffeemakers, Irons and full size Ironing Boards and Hair Dryers. Wheel Chair Accessible Rooms. TDD Phones Available at the Front Desk. Guest Laundry, Ice Machines and Vending on all floors, FAX and Copy Service available. Holiday Inn Express Hotel Tuscola offers Indoor Heated Swimming Pool Hot Tub in the Pool area. 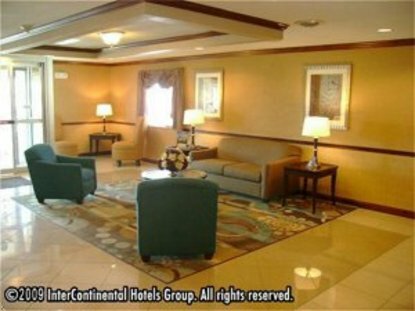 Holiday Inn Express Hotel Tuscola extends to the guests a Complimentary Deluxe Breakfast Buffet to include Cinnamon Rolls, Smart Roast Coffee, toast, bagels, milks, cereal, danish, juices, boiled eggs, and yogurt. The friendly Staff will make your stay a pleasant one. The Holiday Inn Express Tuscola has plenty of free parking This hotel is located in a relaxing rural setting that's easy to locate, just off of I-57 and Rt. 36. The Holiday Inn Express Tuscola has received numerous awards for cleanliness and customer service. This hotel is committed to providing accessible facilities under the American Disabilities Act. If your accessibility needs are not met, please contact the Hotel Manager on Duty. Should you require additional information regarding accessible facilities for guests with disabilities, please call 1-800-Holiday (U.S. and Canada) or contact the hotel directly. For the hearing impaired, TDD service is available at 1-800-238-5544 within the U.S. and Canada.